Had a nice time with Peter's gang last Sunday. Went to Four Seasons Restaurant @ Terengganu Road for dinner. Had a sumptious dinner. Food was not bad. Prices were reasonable. 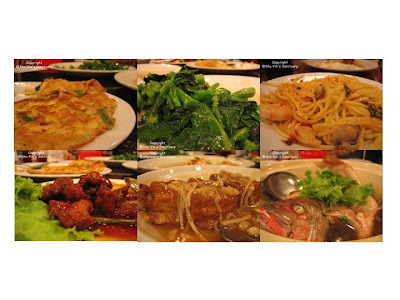 We had 6 dishes and a jug of tea for about RM100. After dinner, we headed over to Chun Hoer's place for a game of Taboo. It was my first time playing the game. I was instantly hooked to it! QUICK! How do you get your team to say APPLE?You can’t say RED, FRUIT PIE, CIDER, or CORE. They’re Taboo— utterly unmentionable words! Think fast, talk fast and don’t say a Taboo word or you’ll get buzzed and lose a point! As you call out the clues, your teammates shout out the answers. Play Taboo. It’s easy. It’s fastpaced. And it’s unspeakably fun! We played for more than an hour or so until 11pm. We stopped b'coz everybody needs to work the next day. It was fun...well, it is always fun to hang out with Justin, Siow Sen, Chun Hoer, Alan and Karen!